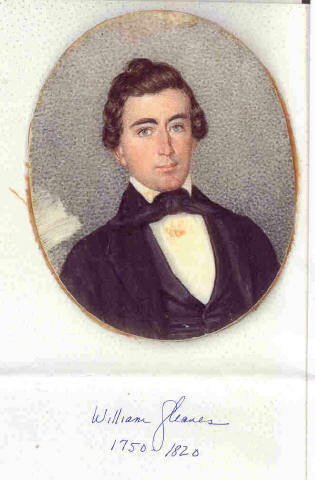 A new cousin from Hilton Head Island was so kind to share a wonderful (first look for most of us) picture of William Benjamin Gleaves (1750-1820). A very handsome man...we are trying to get more information concerning this fabulous find. Naval History Bibliography Web Page -- Includes a citation of: "Gleaves, Albert. The Admiral: The Memoirs of Albert Gleaves, USN. Pasadena, Calif.: Hope Publishing House, 1985. 286 pp." Ringo Starr's mother was a Gleave! Lots of photos from the 2001 Reunion, which was held July 28-29 at Kimberling Inn and Resort, Kimberling City, Mo. This is the home of the Gleaves Family Association web site. This web site is devoted to anyone with the surnames Gleaves, Gleave, Glaves, or Glave -- or those related by blood or marriage to the same. You're invited to submit links, photos, family information, and other materials for posting on these pages. We can create new categories as needed. My father's maternal grandmother was Adeline Gleaves. Your suggestions for content are welcome; just e-mail me. Thanks!